Well, I’ve been off trail almost two weeks now, so I thought I’d update all of you going through “Wired Withdrawal” and let you know how the adjustment back into the “real” world is going. The day after I finished the trail, I took a train to Chicago to visit my sister and her family, along with my friends who still live there. Even though I lived in Chicago for 9yrs, I was not prepared for what I experienced when I exited the tunnel from the train directly into the hustle and bustle of rush hour in downtown Chicago. Talk about a sensory overload! It was definitely a shock to the system on multiple levels. 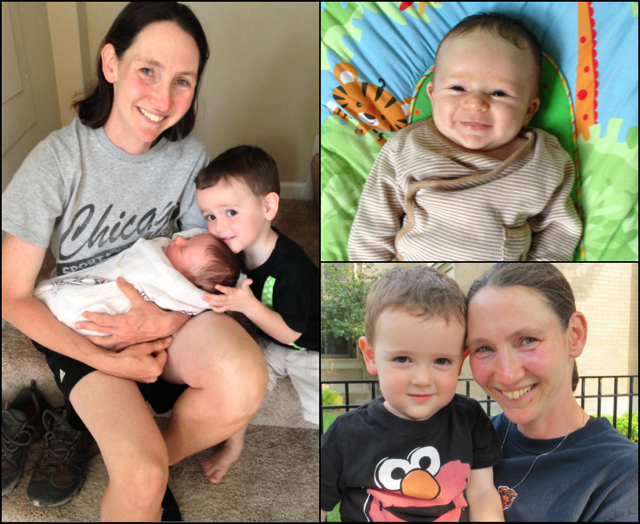 I spent a week in Chicago and it was a packed whirlwind of toddlers, babies, and old friends. Finishing the trail early allowed me this extended visit to Chicago and I really enjoyed it! My nephews are just adorably sweet and it was great to spend quality time with them. The ubercuteness made it difficult to leave, that’s for sure! My sister and brother-in-law gave me a personalized congratulatory shirt for completing the trail. 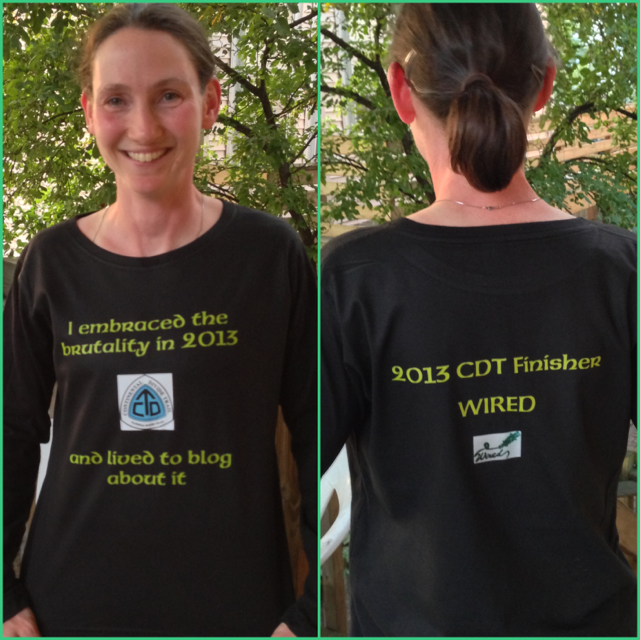 The main CDT website is still young and doesn’t have trail clothes for purchase yet…hopefully soon! I had definitely lost some weight on trail, but it probably wasn’t more than 10lbs. I’ve already put at least a few pounds back on, so that won’t be a problem, ha! I also finally had a bear sighting! 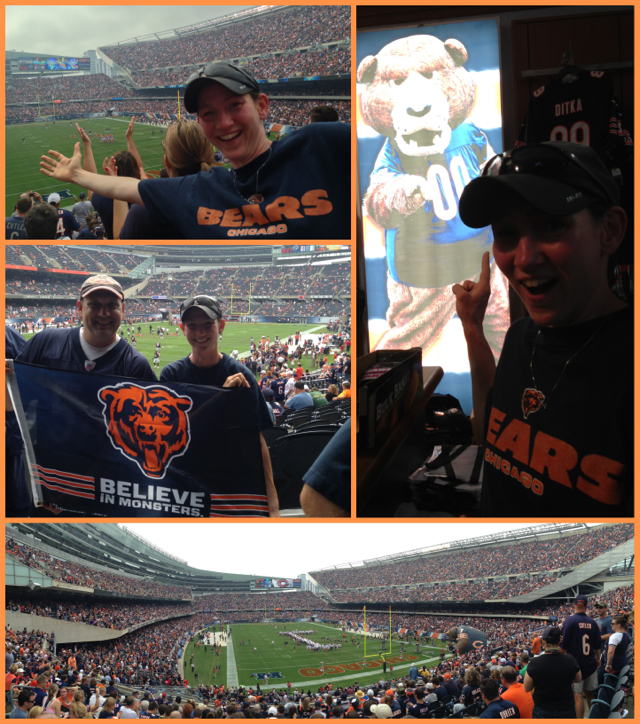 It was at the Bears home opener. My brother-in-law has season tickets and that was my first NFL game. We even got to ride bikes along Lakeshore to the game, good times! Plenty of food was consumed! Here are the only two pictures Siobhan and I managed to take together. On the left is a meal treated to us from a Chicago blog follower named Birdy. Trail magic in Chicago! THANK YOU Birdy! 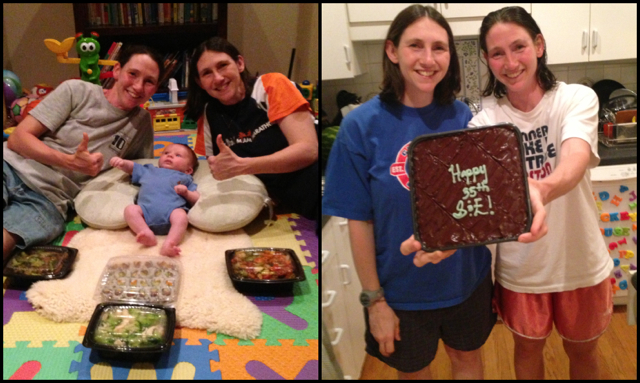 On the right are some iced brownies my brother-in-law got for me and Siobhan…out birthday isn’t for two more months, but it was a great excuse to get brownies since we won’t be together when it really happens! I’ve been back in Portland for two days now and start work the day after tomorrow. It wasn’t until I got to Portland that it all set in…the enormity of the trail and returning to society hit me. I actually did the Continental Divide Trail! It’s difficult to describe the mix of feeling and emotions. There is a definite feeling of accomplishment and pride in how I hiked the trail and maintained the blog. At the same time, I have a peaceful calm and comfort in returning HOME to Portland. Then there are the wanderlust daydreams with flashes of the trail that are beginning to sneak into my mind whenever I see a tree, breathe fresh air, hear a great song, or even eat an Oreo. Combining it all in one basic word, I just feel really HAPPY! Although I didn’t have the bond with the CDT that I had on the PCT, I can still look back on it with appreciation and daydream for eternity about being out there. I’m happy to be home for now and not hiking or blogging daily. My body feels strong, but I definitely feel a need to rest and sleep a lot, so I’m embracing the relaxing for awhile. My achy feet are the only lingering effect I’ve had. I didn’t feel them hurting on trail, but since coming off, they are very sensitive and still swollen. They ache to the bone all throughout and walking without the cushion of a shoe or flip flop is very uncomfortable. On wood floors, I can hear the popping of the cartilage or joints in the balls of my feet as I walk. My toes are numb, which happened on the PCT and I figure will return once the swelling goes down. I remember it slowly disappeared after a month or so of being off the PCT, so it will just take time. In the meantime, I’ve been riding my bike and LOVING it! I think the most difficult part, as usual for me, will be in increase in socialization. I tend to get worn out by lots of socializing and have decided to take it slow and go into my hermit phase for a bit. To my friends out there, you know I’ll be in touch and I just need some acclimation time. I am taking it slow and resting up because I think the return to work in a couple days will drain me. To go from months of solo time and little talking to a room full of energized students where I need to be constantly “on” and engaged will be a big change…but nothing I haven’t done before. It will just be an adjustment. Have you ever made contact again with Optimist and Stopwatch? I am reading their book and they thought very highly of you. Yes! We met up in Seattle a couple years later…and are fb friends. If you go to their website, you’ll see they have a toddler son and travel the world now. Pretty great!